This September, we’re opening up the meetup to a Q&A format. Bring your questions and bring your knowledge. This is an ask-anything format so be ready to learn all the things. Beginner mappers welcome! As usual, doors open at 6p and we’re getting started at 6:30p. Learn to make maps with Justin Palmer! Justin will lead a workshop on how to create maps on July 8th. Bring your laptops and questions as this will be a hands-on Maptime where you will learn how to make sense of a data set and use online tools to create a web map. Some of Justin’s work can be found here. Come draw maps with MaptimePDX! Leave the laptops at home because @MaptimePDX is going analog - AKA it’s arts & crafts time! We will be providing paper, maps, crayons and way to create map tiles from our drawings. Feel free to bring the kids! ###Beginning & Experienced Mappers Welcome! ###Start 2015 with a Mapathon! Come learn about the basics of Open Street Map (OSM) and how to contribute as a remote mapper for local and Humanitarian OSM Team (HOT) mapping projects. Please bring your own laptop. We will provide all the learning materials needed so feel free to come even if you’ve never mapped before! This is a beginner friendly event with experienced mappers who can help. This is especially helpful for beginners. Feel free to skip this segment if you’re already comfortable and experienced with contributing to OSM or come early to help others or work on another mapping project. 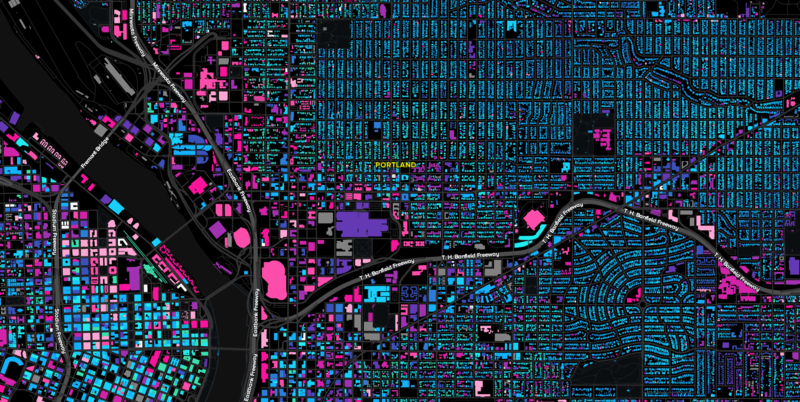 Join in on mapping needs for “PDX Building Imports” and the Missing Maps Project. 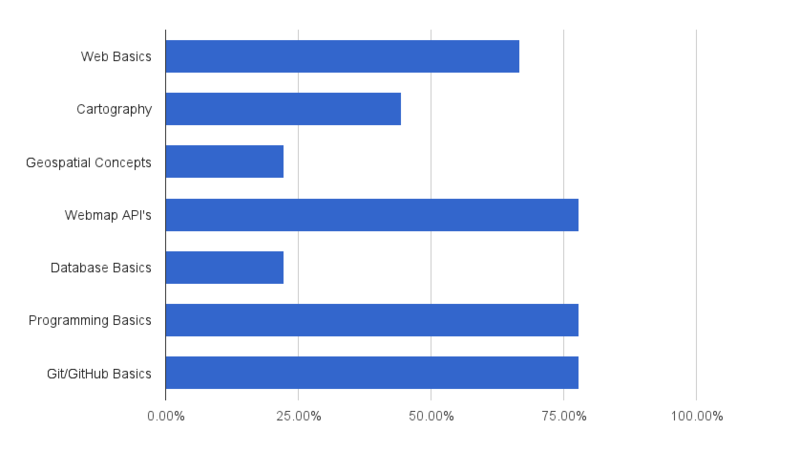 The following is an in-depth look into our recent survey to the Portland, Oregon Maptime chapter. 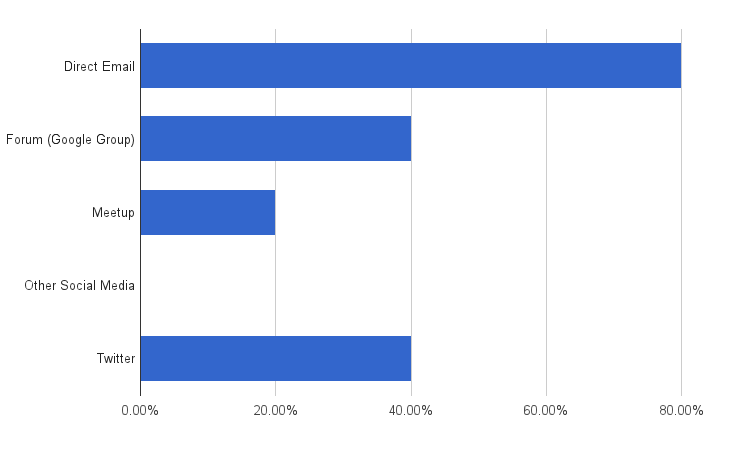 We ran it for a couple weeks in November and ended up with ten respondents. If you you don’t want to look at the detailed responses, you can skip to the summary. What do you most want to learn about? I love the idea of Hack time, but I think it sounds advanced to a lot of folks who might be scared off by it. Hack time might need a better name to be compatible with Maptime… Something like “problem solving” time? I think that being involved in a project will help me best learn concepts, tools, and methods. I haven’t attended much but when I have I see new people that are interested but maybe aren’t taking that next step. Consider pairing people up or doing a ‘speed dating’ style round-robin to introduce folks and see if there is a match on projects whether mentor/learner or collaborators. Get side or group projects going outside of meetups. Get that energy building The Portland Python Mentoring group has an interesting structure. People pair up at the beginning of the night and work together on something. Is there something you would be interested in teaching? Sure. I would be most interested in participating as a mentor on the subject, working with a small group one night, instead of say giving a large talk. I like the idea of focusing on individual peoples needs and interests than trying to keep everyone interested and engaged in a group talk. Though those talks have their place, especially once people just learning start to get some knowledge and experience under their belt. Consider doing a meetup that you have a call for mentors on a subject and turn people loose in groups. How would you prefer we communicate with you, the community? Obviously the more local the better! It would be interesting and inspiring to receive a newsletter that summarizes what was covered/done at MapTime events and describes projects people are working on. Of course, this would take a considerable amount of work to produce. How would you prefer to communicate with us, the organizers? Workgroups to help develop projects, better preparation and description of topics. I feel like I always see Maptime dates… the day after they’ve happened. I’m trying to be more proactive about it – it might just be me. Being more inclusive of the non-hacker/inexperienced but interested. It is very intimidating being in a room of very experienced and intelligent people and having a hack session and not knowing where you fit in as you’ve not done any of the work before. I recognize that this might not be interesting for all attendees, but maybe a quarterly ‘beginner night’ would be enticing for those interested. More engaging speaking style, more hands-on, more discussion built-in, get people excited! Standard 40 minute talk after work is recipe for tiredness. If maptime is trying to be different, let’s see it! 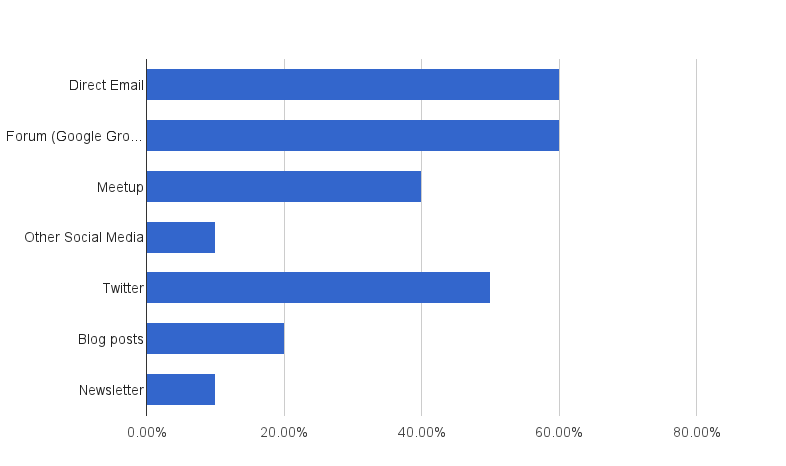 If all the Maptimes are doing this survey, would love to see the answers to question 1 as a bar chart for all of Maptime, and also for Maptime by city, to see if there are geographic differences in what people are interested in. No matter what, you should present the results at a Maptime! I’ve been unable to make it for some time so perhaps you’ve done some of the things I’ve suggested. You’re doing a great job creating a meeting space and community. Keep it up. Yer the tops! People would like to learn about git/github, web map api’s (such as Leaflet), programming basics (i.e. python), and web basics (html, css, etc). People are fans of tutorials and show & tells. Slightly less so of hack-times. Two respondents are potentially interested in teaching or maybe being a mentor. How would you prefer to send/receive communications? Email, the Google Group, and Twitter are the prefered methods of communication. It sounds like we’re doing well in general. Ideas for improvement include making sure we keep beginners in mind, improved planning/preparation, shorten presentations (40+ minutes is too long), and workgroups/mentorships. Here are our thoughts culled from the suvey results and discussion of those results at the December MaptimePDX. We’ll continue to send out feedback surveys periodically, with some minor tweaks. First, we’ll try to break them down into small bites, i.e. 1-3 questions. Second, we’ll probably switch to Google Forms to give us a little more control. 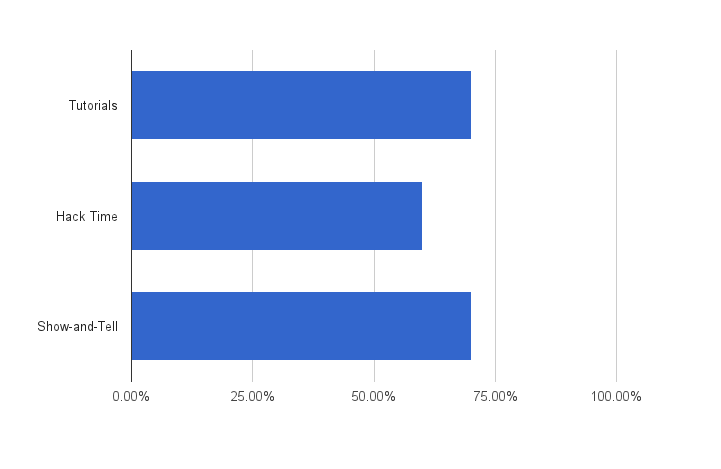 I (Matt) used SurveyMonkey this time around thinking the free version let us download the results data at least in csv. Not the case; lesson learned! Our current forms of communication seem to adequate, if not a little clunky at times. We’ll continue using Twitter, the Google Group, and Calagator as our primary methods of communicating with the community. We’re also going to look at adding Eventbrite (so we can get some RSVP capabilities) and cross posting to other related groups (PDX-Osgeo) to the mix. We’d also like to figure out a way to streamline communications so we’re more consistent/timely with the channels of communication we use (suggestions welcome). Likewise, communicating with the organizers via Twitter, the Google Group, and direct email seem to be adequate (again, sometimes clunky). On the email front, we now have an alias set up that will reach us directly: portland@maptime.io. As we’ve settled in to our roles as organizers, it’s become more and more apparent that we need some longer-range planning to get the most out of maptime. This survey was the first step towards that goal. Now that we have much clearer view of the community’s learning interests & needs, we’re planning on doing a longer-range planning session, tentatively in late January. It will be an open session and probably online to help make it easy to attend. Stay tuned for details. Thank you to everyone who filled out the survey. And thank you everyone who has attended a Maptime session. Maptime has had a pretty good year, and we’re hoping to make 2015 even better!